Walking tour of Perrine Hill. See where Molly Pitcher fought. Meet at Visitor Center at 11:00 A.M. Walking tour of the battlefield. Meet at Visitor Center at 1:30 PM. Held at 2 PM at the Visitor Center Auditorium. Program on “Molly Pitcher at Monmouth. Visit the several sites claiming to be Molly Pitcher’s Well. Drive to the heart of the battlefield to visit the different spots that have been claimed to be the location of Molly’s well. Tour will end at the new Molly Pitcher Overlook on Perrine Hill. Meet at Visitor Center at 1:30 PM. Driving tour of the battle area east of Freehold. Visit two important seldom seen areas of the morning portion of the battle, the East Morass and Briar Hill. Meet at Visitor Center at 1:30 PM. Visit the scene of fierce fighting at the in the early afternoon. Meet at Visitor Center at 1:30 PM. Memorial Day observance at the Park, 2 PM. Walking tour of the battlefield (Hedge Row and Parsonage). Meeting held at 7 PM at the main branch of the Monmouth. County Library, Symmes Drive, Manalapan. Driving tour to visit the site of the American encampment encampments at Ponolopon Bridge the day before the battle of Monmouth. Encampment and programs 10 AM-4 PM. Encampment and programs 10 AM-3 PM. 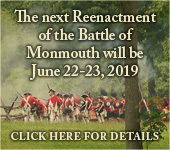 239th Anniversary of the Battle of Monmouth. Special programs and tours 10 AM-4 PM. Special programs and tours 11 AM-4PM. Joint Program. “The Monmouth Campaign” by David Martin. “The Army Celebrates the 4th of July,” by George Dawson. Held in Boyd Park in New Brunswick, 2 PM. Program on the 14th New Jersey at the Battle of Monocacy. Held at 2 PM in the Visitor Center Auditorium. Program on the role of the New Jersey Regulars and Militia in the Battle. Program on the 14th New Jersey at the Battle of 3rd Winchester, and the death of Major Peter Vredenburg. Meeting held at 7 PM at the main branch of the Monmouth County Library, Symmes Drive, Manalapan. Craig House closes for the season. Program on the 28th New Jersey at the battle of Fredericksburg. 2 PM in the Visitor Center Auditorium. The Park itself is open longer than the Visitor Center, but the hours are seasonal. Call the Park office for current hours. The Park’s physical address is 16 Business Route 33, Manalapan, NJ 07726.